The pre-dawn, seaside raid on Saturday targeted Abdulkadir Mohamed Abdulkadir. The U.S. troops are not believed to have captured or killed their target. NAIROBI, Kenya — The man whom U.S. Navy SEALs tried to take down in Somalia over the weekend was a Kenyan who had plotted to attack his country’s parliament building and the United Nations headquarters in Nairobi, according to a Kenyan government intelligence report. In the internal report by Kenya’s National Intelligence Service, Abdulkadir is listed as the lead planner of a plot sanctioned by al-Qaida’s core leadership in Pakistan to carry out multiple attacks in Kenya in late 2011 and early 2012. 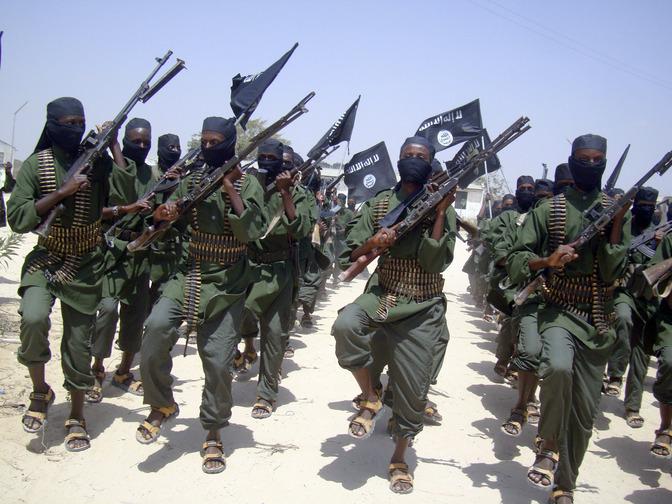 The AP has previously reported that those attacks, linked to the Somali Islamic extremist group al-Shabab, were disrupted. The report, which was leaked to AP and other media in the wake of the Sept. 21 terror attack on Nairobi’s Westgate Mall that killed more than 60 people, lists Samantha Lewthwaite — a Briton known in British media as the “White Widow” — as one of several “key actors” in the plot to attack Parliament buildings, the U.N. Office in Nairobi, Kenyan Defense Forces camps and other targets. The plotters also intended to assassinate top Kenyan political and security officials, the report said. Police disrupted that plot. Lewthwaite, who was married to one of the suicide bombers in the 2005 attack on London’s transit system, escaped capture when she produced a fraudulently obtained South African passport in another person’s name. Late last month Interpol, acting on a request from Kenya, issued an arrest notice for Lewthwaite. The National Intelligence Service report, in an entry dated exactly one year before the Sept. 21 mall attack, said al-Shabab operatives were in Nairobi “and are planning to mount suicide attacks on undisclosed date, targeting Westgate Mall and Holy Family Basilica.” Two suspects were believed in possession of suicide vests, grenades and AK-47 assault rifles, the report said. The men who attacked the Westgate Mall last month and held off besieging Kenyan troops for several days were armed with grenades and AK-47s, but apparently had no suicide vests. It was unclear if one planned attack on the mall was foiled and then carried out again or if it was merely postponed for a year by al-Shabab, which claimed responsibility for the carnage. The internal document shows that Kenyan intelligence officers have detailed information about plots and individuals tasked with carrying them out, and that the spy handlers face a continuous threat. Other targeted sites included the Hilton Hotel, the Yaya shopping mall, the office of the prime minister, and possibly the embassies of the United States — which was blown up by al-Qaida in 1998 — and of Britain and Israel. The SEAL raid in Somalia was only one of two anti-terror missions by U.S. forces in Africa over the weekend. In Libya on Saturday, the U.S. Army’s Delta Force captured Nazih Abdul-Hamed al-Ruqai, known by his alias Anas al-Libi, an al-Qaida leader linked to the 1998 American Embassy bombings in Kenya and Tanzania. That raid prompted a warning Monday from a group of Libyan Islamic extremists who vowed to avenge al-Libi’s capture. The cities of Benghazi, Bayda and Darna are strongholds of Islamic extremists who are carrying out political assassinations targeting political activists, judges and members of security agencies. “We owe it to God to fight whoever betrayed his country and involved in this conspiracy,” the group said. U.S. Defense Secretary Chuck Hagel said Sunday that al-Libi was in U.S. custody. A U.S. official familiar with the case said later that al-Libi was taken aboard a U.S. warship for questioning. The official spoke on condition of anonymity because he was not authorized to release details. U.S. Secretary of State John Kerry on Monday defended the capture of al-Libi, saying complaints about the operation from Libya and others are unfounded. Kerry said the suspect was a “legal and appropriate target” for the U.S. military and will face justice in a court of law. Kerry added it was important not to “sympathize” with wanted terrorists. “I hope the perception is in the world that people who commit acts of terror and who have been appropriately indicted by courts of law, by the legal process, will know that United States of America is going to do anything in its power that is legal and appropriate in order to enforce the law and to protect our security,” Kerry told reporters after meeting with Russian Foreign Minister Sergey Lavrov on the sidelines of an Asia-Pacific economic conference in Bali, Indonesia. “Members of al-Qaida and other terrorist organizations literally can run but they can’t hide,” he added.